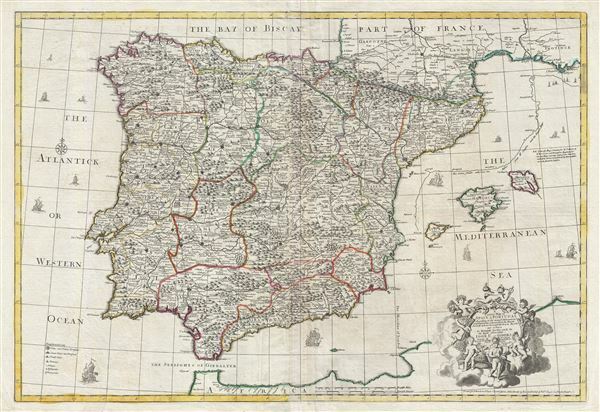 An exception c. 1708 elephant folio (large format) map of Spain and Portugal by the English cartographer John Senex. This enormously proportioned map covers the entirety Iberia from the Atlantic Coast to Minorca and from the Bay of Biscay to the Strait of Gibraltar. Senex includes the Balearic Islands of Ibiza, Majorca, and Minorca. A parallel line running about 1.5 inches east of the Catalan coastline represents Senex's correction on the eastern longitude of Iberia over the earlier maps produced by Sanson and various Dutch cartographers. This map was drawn and engraved by John Senex in London. It was published by T. Bowles and T. Bowles and Son. The decorative allegorical cartouche in the lower right quadrant was most likely designed and engraved by H. Hulsbergh, but it is not signed. This map was most likely printed in John Senex's Modern Geography; or, All the Known Countries in the World. Very good. Minor centerfold wear. Two sheets joined by publisher. Original platemark visible. Blank on verso.